Indiana women's basketball — and a former Portland prep star — finished with a bang Saturday. Bendu Yeaney, a 5-10 freshman guard from St. Mary's Academy, helped the Hooisers go 6-0 in a 16-day postseason and win the WNIT. 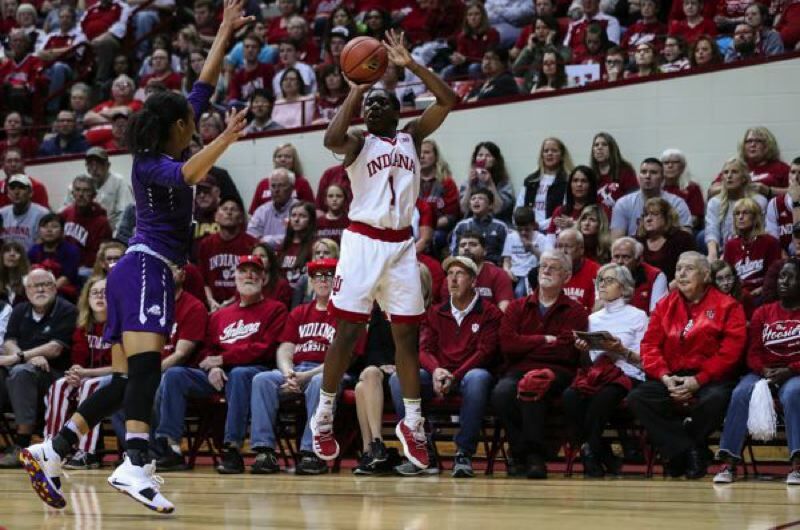 Yeaney starred in the final quarter, lifting Indiana to a 65-57 finals victory over Virginia Tech before an Indiana women's basketball record home crowd of 13,007 at Bloomington, Indiana. The Hoosiers (23-14) won the fourth quarter, 22-13, to earn the title. Yeaney had nine of her 14 points in the period. The spree included a 3-pointer with five minutes left that broke an 0-for-13 Indiana drought from beyond the arc and gave the Hoosiers a six-point lead. "I don't know if I've ever coached freshmen who are more confident than those two kids (Yeaney and 5-10 fellow guard Jaelynn Penn from Louisville, Kentucky)," Indiana coach Teri Moren said. "They never get down. They don't get discouraged. If anything, they get a little bit ticked off, and it encourages them and makes them want to fight and do better. "And normally the result of that is something good happens, because they stay aggressive, and that's special. That's hard to teach, especially with freshmen, to have that kind of confidence." Yeaney was a steady contributor all season. She played in 36 of 37 games, starting every time. She averaged 35.1 minutes per game and was fifth on the team in scoring with 8.4 points. She also had 5.0 rebounds and 2.2 assists, and shot 37.1 percent from the field, 39.4 percent on 3-pointers and 71.3 percent at the free-throw line. Indiana finished with an 11-game win streak at home. The Hoosiers, 54th in RPI, got over the disappointment of not being picked for the 64-team NCAA Tournament. "We all thought we should have been in the tournament ... how we were playing down the stretch was really good," Moren said. "To be left out of the conversation gave us motivation. If we were going to be in the WNIT, we were going to play this thing to win it, and that's exactly what we did." • The Pac-12 softball race is a five-team battle between Arizona State (5-1), Washington and UCLA (both 7-2), Arizona (6-3) and Oregon (4-2). Oregon State is 3-6, with one win out of three last week against the Ducks. • Portland State is 3-3 in Big Sky softball and in a four-way tie for third behind North Dakota (5-1) and Northern Colorado (4-2). The Vikings will play three games this weekend at Sacramento State (3-3), then visit Northern Colorado for three games April 13-14. The Viks already have faced North Dakota. • In baseball, the University of Portland is 4-5 and tied for fourth in the West Coast Conference after winning two series in a row. UP plays a three-game set at Gonzaga (4-5) Friday-Sunday. • For some college track fans, the outdoor season kicks off Saturday with the 28th Pepsi Team Invitational at Hayward Field. Oregon, Washington, Washington State and BYU are entered. Field events begin at 11:30 a.m., with the first track race at 2 p.m.
Then it's on to an assortment of invitationals leading up to the May 4 Oregon Twilight in Eugene and the Pac-12 championships (multi-events May 5-6, other events May 12-13) at Stanford. The NCAA West regional is May 24-26 at Sacramento, and the NCAA Championships return to Hayward from June 6-9. The other big event at the U of O, of course, is the Prefontaine Classic, May 25-26, a Diamond League meet with another star-studded field.